Dr. Nan-Sheng Lin is president and co-founder of InnoMedia, where he works closely with InnoMedia’s chairman and CEO, Mr. Kai-Wa Ng to help direct the company’s strategy, growth, and business partnerships. Prior to InnoMedia, Dr. Lin was executive vice president at Digicom Systems, Inc., a leader in the development of internal, external, and software modems. He also held the positions of chief scientist and vice president of cellular and digital radio at Teknekron Communications Systems, a company specializing in providing total solutions to the telecommunications industry, where he was an early leader in the development of digital cellular phones. 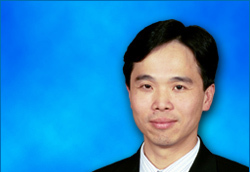 Dr. Lin has authored several papers and holds patents in the areas of wireline and wireless communications. He is also active in a number of business leadership forums. Dr. Lin has served as an overseas expert member of the Strategic Review Board for the government of Taiwan, a coordinating member of the National Science Council’s Wireless Communications Committee, and a guest member of the Technical Advisory Committee for the Industrial Technology Research Institute. Dr. Lin holds a B.S. in Electrical Engineering from National Taiwan University, in Taipei, Taiwan, R.O.C. and a M.S. and Ph.D. in Electronic Engineering and Computer Sciences from the University of California, Berkeley.